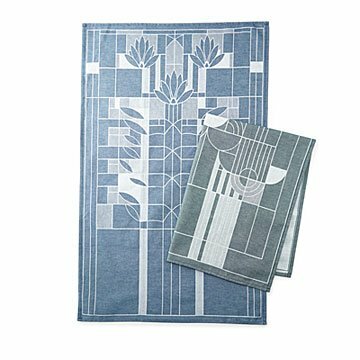 These super-soft, woven tea towels feature designs by iconic architect Frank Lloyd Wright. Frank Lloyd Wright was known is his time for being innovative and experimental. Sometimes too experimental, according to critics. His "Saguaro Farms and Cactus Flowers" design, for example, was intended for the cover of Liberty Magazine but was cut for being too avant-garde. Fortunately, the design resurfaced and is now on display in these super-soft, woven tea towels. Also making a comeback in towel form is Wright's "Water Lilies" design, which was once meant for an art glass window (that never actually got produced). Give one to the art lover or architecture buff in your life, or pick up the set to celebrate a win for good design. (Sorry, critics, FLW was right on this one.) Made in Portugal. My gf loves FLW and every chance I can get to add to her collection is fantastic. These towels are great!